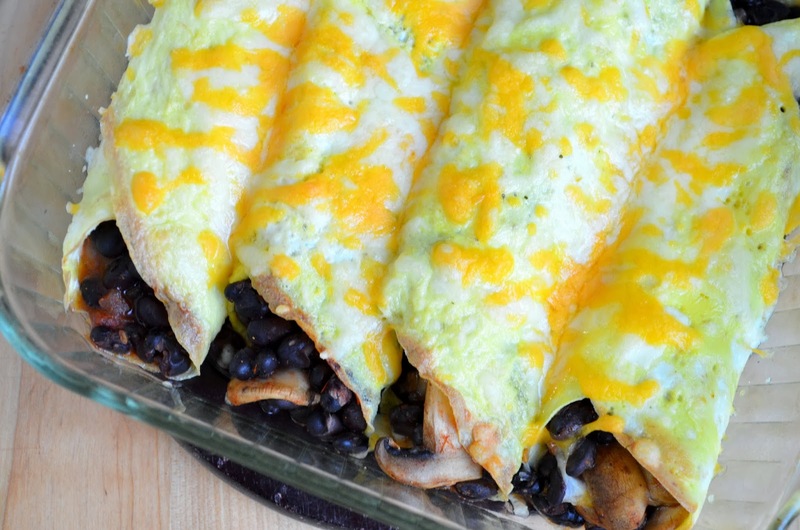 These aren't just any enchiladas. These are made with homemade egg "tortillas"! 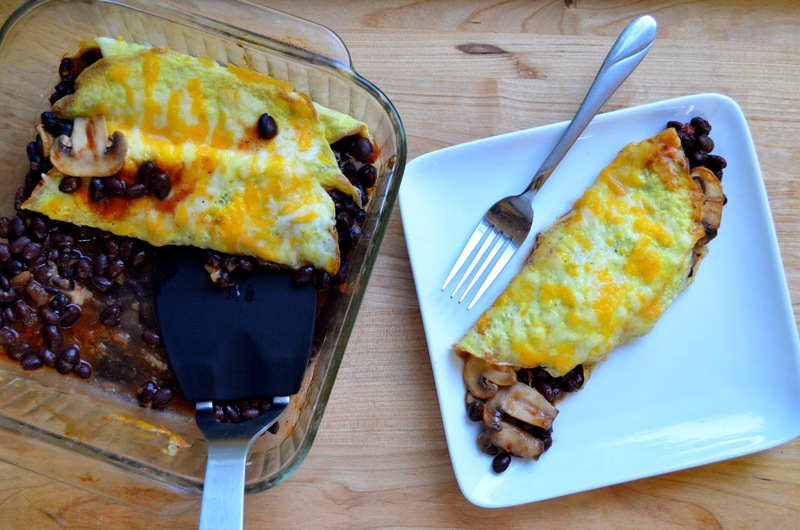 They are thin, crispy on the edges, and wonderful with this black bean filling for a hearty breakfast or dinner. I didn't se out to make these gluten-free. I just thought that egg "tortillas" were a fun idea. Now I know they are! I will be making them for a long time because they're easy and so good! I filled these with mushrooms and black beans but they're easily adaptable. You could add corn, bell pepper, jalapenos, zucchini, or even shredded carrots. On the picture at the top there isn't any enchilada sauce, but some of the pictures lower down so have the enchilada sauce. That's because I made them twice in a week because they were that good. Also, I forgot the enchilada sauce at the store the first time I made them. Oops. So, if you want to skip the enchilada sauce then that's okay. But, it really does add a lot of flavor to the dish. 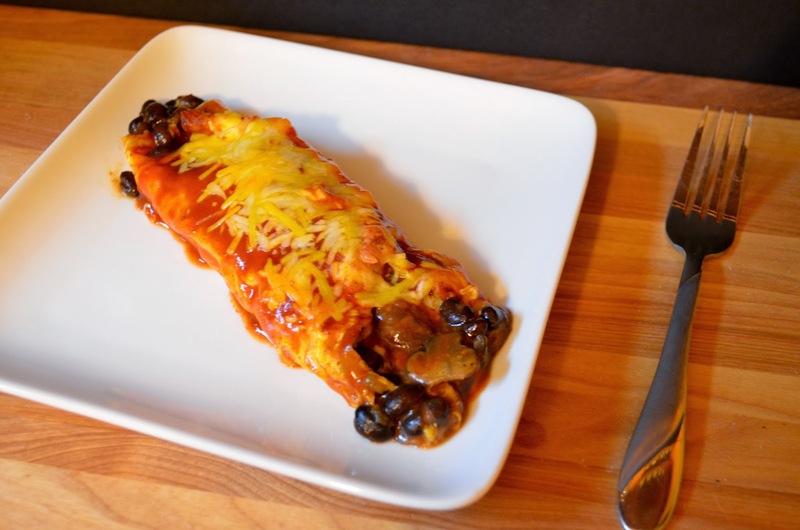 I know some of my enchilada sauced pictures are a little dark. Of course that's because I made them to late in the day and it gets dark earlier so I missed my opportunity for natural light photos. It happens. I used a 10" skillet when making these because I wanted the egg to be super thin when I cooked it so that it was more like an actual tortilla. Be sure the let the egg cook all the way before trying to move it in the pan or it will definitely stick and break. I did grease my non-stick pan a little just to make sure it came out. I also used a lid while cooking the eggs so that the top steamed while the bottom cooked. That worked much better and resulted in more evenly cooked eggs than when I didn't use a lid. If you have any questions, please ask! Happy Cooking everyone! 1. Preheat oven to 400F. Line an 8”x8” baking dish with nonstick foil or spray with nonstick cooking spray, set aside. 2. Heat a 10” skillet on the stove to medium-high. Break one egg into a small dish, then stir it with a fork until well blended. If necessary, lightly spray the skillet with nonstick cooking spray. Pour the egg into the pan and tilt the pan until the egg evenly coats the bottom (like a crepe). Cover, and cook for 1-2 minutes or until the egg is cooked through. Place on a clean plate and repeat with the remaining 3 eggs. 3. When the eggs are done and on the plate, cook the mushrooms in the pan 4-5 minutes or until cooked down, stirring occasionally. Stir in the black beans, salsa, ¼ cup cheese. 4. 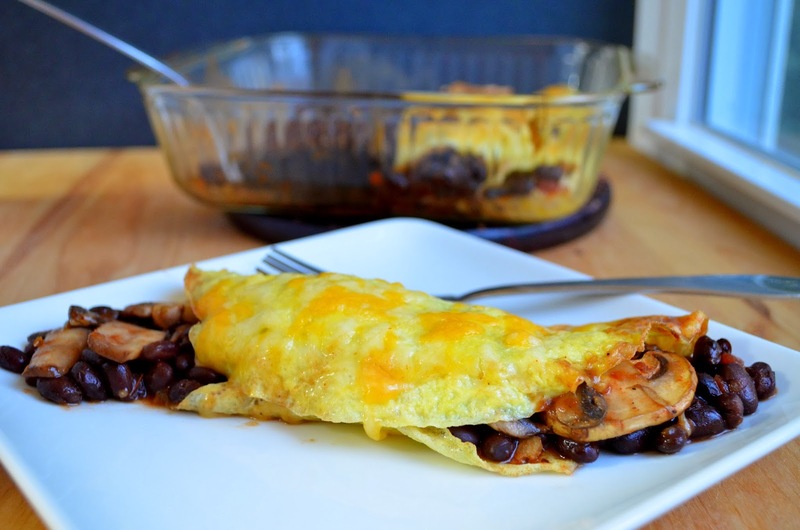 Gently lay one egg “tortilla” in the prepared baking dish. Scoop ¼ of the black bean mixture into the “tortilla” and gently fold over. Repeat with the remaining three egg “tortillas” so that you have four enchiladas in the pan. Pour the enchilada sauce over the top. Sprinkle evenly with the remaining ½ cup cheese. 5. 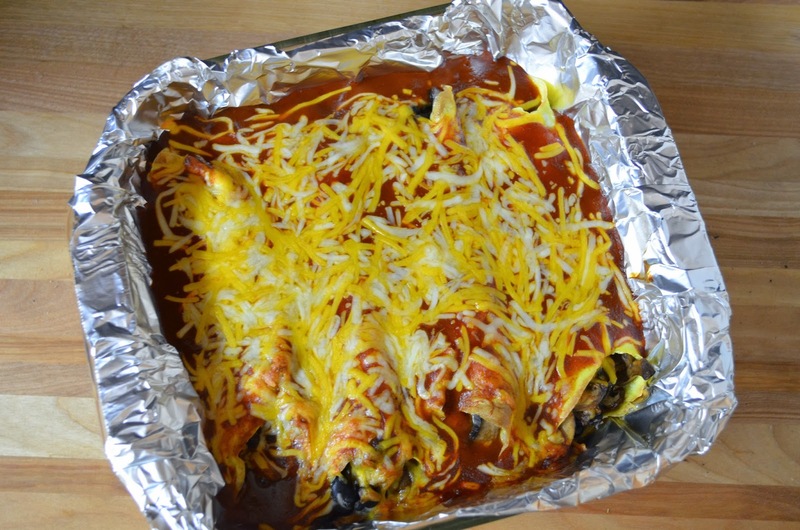 Bake for 12-14 minutes or until the enchiladas are golden brown on the edges and the cheese is melted.